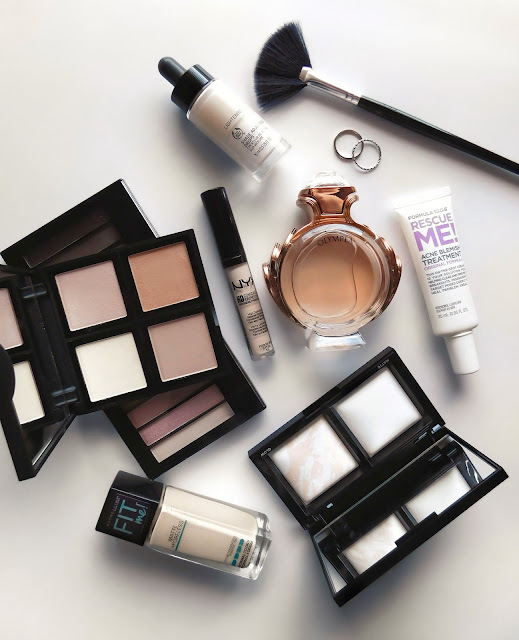 It certainly wasn't easy narrowing it down to my 8 most-loved beauty products of 2016 but if I didn't, we would all be here for days! So today I will be summing up what amazing products I have been reaching for the most during the past year. The first pick of the bunch is Maybelline's Fit Me Matte + Poreless Foundation that is STILL one of my all time favourite foundations (from the drugstore at least). It gives me medium-full coverage without it looking cakey, it feels so breathable on my skin and lasts incredibly well throughout the day. This foundation is an absolute winner in my books and I highly recommend it if you have an oily skin type. It's no surprise that the Makeup Revolution Iconic 3 palette made it to this list because, it's a lovely dupe for the cult classic Naked 3 by Urban Decay. This is such a versatile palette for creating any look you desire for day or night, and the quality of the eyeshadows themselves are amazing for the price. The shimmery rose gold hues are simply to die for so it's no wonder why I'm obsessed with this palette! When I got my hands on the NYX HD Concealer mid last year, I had no idea that it was going to be my go-to concealer. Having fair skin, it was near impossible to find an affordable concealer that was as light or lighter than my own complexion. 'Porcelain' is the perfect shade for me as it has a blue undertone so it's not too yellow or too pink. I think it's safe to say that I have found my holy grail concealer for highlighting my face. A second repurchase of mine is the Formula 10.0.6 Rescue Me Acne Blemish Treatment because it actually works. As soon as I see a pimple surfacing, I immediately reach for this and it really helps to dry them out before they get to that nasty inflamed state. I bought this on a whim and I'm so glad that I did - I just know it'll be sticking around this year as well. If you've been reading my blog for a while, you would know that I absolutely adore the e.l.f. Illuminating Palette. These shades can be used all over as bronzers, blush, highlighters and even as eyeshadows. I love the subtle radiance these powders give me which is just what I like for every day and in the Summertime even. I definitely think it's worth the hype, it's truly a gorgeous palette. I had a whiff of Olympea by Paco Rabanne in a magazine and it was love at first smell! It's fresh, floral, sweet and it lasts all day on me. It became my signature scent for a good while in 2016 because, there's just something about it that makes me feel more confident and ready to take on the day. The struggle of trying to find a foundation to match my pale skin was over when I got my hands on The Body Shop's Shade Adjusting Drops. I use these drops almost every time I wear makeup as they do a really great job of neutralising yellowness. I can now where all those foundations that never quite matched me with this pale skin savior! My final best-loved product of 2016 is the Bare Minerals Invisible Light Translucent Powder Duo. The silky matte powder blurs imperfections as well as pores, and the glow powder just gives you a sheer hint of radiance to the skin that I personally love for day to day. It's a lovely product and unlike any face powders I own so it instantly became a hit for me. What were your favourite beauty products of 2016?